At the close of Part 1 of this interview, which you can read here, Tony had just joined the Blades. But within a few months it was a case of out of the frying pan into the fire, with the Blades in the Play Offs trying to stave off relegation from Division 2. A two-leg defeat to Bristol City condemned the Blades to Division 3, I ask him whether he had any regrets? “I knew it was the right move to get out of Watford, I had to get out. Obviously, when you get relegated you think,”What have I done?” but I was having fun in terms of the camaraderie. The fact that he (Bassett) had gone back and got one or two of the others, it was a good bunch of players and people." "You lot need to play as a team and to do that you all need something in common to bond you. If that's "hating my guts" it is fine by me." 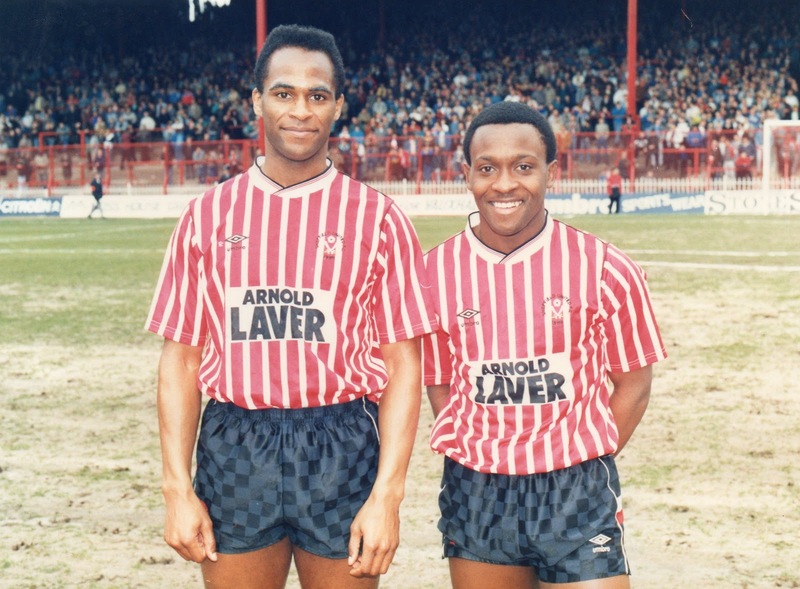 That summer, post relegation, Dave Bassett invested £30,000 in a striker from Doncaster Rovers that you went on to form a lethal partnership with. What was it that made your partnership with Brian Deane so strong? 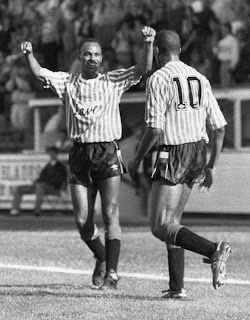 Dave Bassett started the season with a completely new strike pairing of Deane and Francis Joseph, the pair having impressed in pre-season. 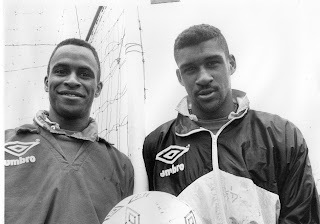 Both scored in a 3-1 opening day win at Reading, but an injury Joseph picked up in that game gave Tony an opportunity that he needed no second invitation to accept. What happened to the match ball? As well as pushing for promotion that season, we also had a decent cup run and several people, knowing I was interviewing you, mentioned your goal against Huddersfield in the 3rd round at Leeds Road. You also scored in the vital game at Molineux, the penultimate game of the season when a 2-2 draw secured the title for Wolves and promotion for the Blades. "The game at Molineux was as tense a match as you'll ever get to play in. In the final seconds the referee blew his whistle and Stan (United captain Paul Stancliffe) and Chris Wilder were off celebrating; climbing the fence in front of the away fans, throwing shirts to the crowd. They suddenly realise it was for a free kick and Wolves were playing on!" "One of those funny moments that you can look back on and laugh, but gosh can you imagine, can you imagine if they had gone and scored? And we would have had to go to Bristol and win.....which we would have. I really believe that. The only reason we didn't was because we had been promoted and didn't give a good account of ourselves due to alcohol poisoning." The following season saw United in Division 2, as it was then, and nobody's favourites for promotion, yet it was to become one of the most memorable in the Blades' recent history. The camaraderie remained. "Harry made additions, but they were players that fitted into the framework. Yeah we played a direct style, you can't get away from that, but we were effective and we played more and more football as we went up." Were we not harshly done by though? It was exciting to watch, we scored goals, we had pace and a great supply from wingers like Alan Roberts, Ian Bryson, Peter Duffield and Paul Wood. It was more than just direct football. "We had unbelievable wide players. I can't give enough credit to the wingers. Harry always got quality wingers; from Alan Roberts through to Glynn Hodges there were always wingers who could deliver crosses into the danger areas. That creates chances and goals. Me and Brian (Deane) might have taken the plaudits, but I'd love to retrospectively look at the stats now; crosses, passes completed and you would read a whole different story. Some of the stats would have been phenomenal for the wingers and also the yards covered by our midfielders. It would tell different stories about different players, give them credit for areas where perhaps they unfairly didn't get it at the time"
"I am told now that they are even monitoring speed of pass, foot to foot and the time it takes to get it under control. Unbelievable analysis to the nth degree. It's not just that Barcelona keep the ball, it's the pace with which they move it that is the difference." From that season you started to suffer more frequently with injuries. Why do you think that was? Was there something about the way you played that made you more susceptible? "Most things emanate from your back, if you get a dodgy disc like I did, then your hamstring goes because you're not running properly. Frenchie (Blades physio Derek French) was a great physio, but there wasn't the science behind it that we have now. My league career ended at 33, but I could have played on longer in a fit body. I was fortunate my asset was pace, stamina wasn't as important. Now they all have stamina, they all last 90 minutes comfortably. You don't see players seizing up with cramp these days, do you? Whereas back then...mind you the heavy pitches didn't help"
"Injuries interrupt your career and you try and come back too soon. There is a pressure on the management to get you back in. The fans want to see you back sooner. If the team isn't playing well it all adds to things a manager is juggling. Maybe my body wasn't fully up to the stresses of playing full-time. Maybe, the fact that I hadn't trained full time from the age of 16 and then suddenly I was doing it at 23/24 was too much for my body at that point"
Being on the bench did have its perks, as I reminded Tony of an impromptu visitor he had whilst sat on the bench for United. "Another fantastic moment", I ask whether it was against Norwich? To which Tony replied; "Why would I remember the game?!" Leicester away, the final game in the promotion season of 1990 is my favourite ever United game and it is a highlight for Tony. "By miles my career highlight, but I have to say my one non-league England cap also made me very proud. 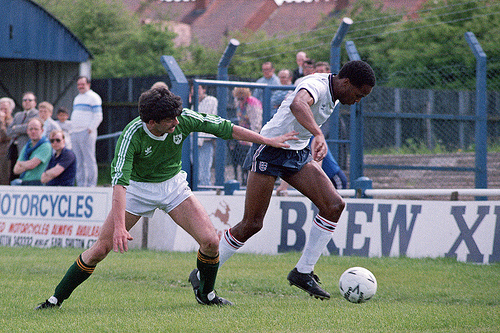 It was part of a two game series against Ireland and it was also my last match in non-league prior to joining Watford. Recently going through my Mum's loft I found huge amounts of memorabilia that she had kept. I had my cap and shirt, but she had also kept the Ireland shirt from the other game of the two match series where I was a sub. There was a photo of me in that game, an old Welling shirt and so much else I didn't know still existed"
Going back to Leicester, the Blades went into the final game of the season level on points with Leeds, but behind on goal difference. A win would guarantee United promotion. A defeat for Leeds as well and we would be champions. It was a rollercoaster of emotions that day, which saw United come from behind to win 5-2, but miss out on the title thanks to Leeds victory at Bournemouth. Meanwhile, back in Sheffield, Wednesday were suffering unexpected final day relegation and passing the Blades going in the opposite direction. I asked Tony what were his main memories of the day? "I can't remember much about getting to the game, my first abiding memory is Harry's team talk before we went out there and it felt like...ha ...such a major thing. So major that I wasn't nervous, I'd gone beyond nervous or worried and I was in a really calm place. I don't know where that is, because I've not been back there since! Calmer than I had been at any game, almost as if it was inevitable, that it was our destiny. A strange feeling." "Then I went out on to the pitch and saw all the fans there, we had obviously seen it in the warm up but, you hear the noise...You can pull out all the clichés because it was back of the neck stuff. So I'd gone from calm serenity to everything going through your mind waiting to start, but once game kicks off that's it your mind is on the job. The plays, the movement, the awareness of team-mates, it all takes over." "But then you go one nil down in a must win game, but at no time, even at 1-0 down did I ever think we were going to lose and I am not sure any of the other lads did either. I need to look at the footage again now to see if heads go down after the goal, because I don't recall any of that. I know I had this unbelievable faith in the guys around me that they were going to pull us through." Talking of Wilf, there was an infamous scene in the United BBC documentary series which showed Bassett and his assistant Geoff Taylor arguing at half time (whilst trying to advise the players) about who was the zone man at corners. I asked Tony if that was Wilf? "Now that's a story. You would need more than a one page blog to run through that! That and the Meaning of Life are the two great unanswered questions aren't they?" I asked him what it was like having the television documentary going on as the season reached its finale and did he still play the saxophone (something that featured heavily in the episode titled ‘The Players’). "Nah I've not played the saxophone for ages. The TV series was fantastic. If you could write a script saying it is the centenary year of my club, what will be the perfect season? We nearly had it. If we had won the league maybe...but I'm picking at straws. We had already gained one promotion, we had a BBC camera crew following us, being broadcast on national telly every week, you get promoted, it goes to the last game on a beautiful sunny day, you take 10,000 fans away and I'm not even mentioning the cherry on the top which was Wednesday getting relegated, because that would be wrong.....!" "That season had something for everyone, we had a decent cup run, maybe lifting a bit of silverware would have been the cherry on top, but that's just a bit greedy. Life changing experiences for players and fans alike." "A fantastic, fantastic day and probably the proudest day of my life. The final whistle went, the crowd rushed on." You also got a kiss from Harry, is he a good kisser? "Not bad....that's probably my biggest regret ha..ha! As I said, something for everyone!" In the final instalment whicjh you can read here, Tony talks about life in the First Division at United, his sudden departure from Bramall Lane, his time at Notts County, Hereford and Cliftonville, more non-league days and what he is up to now.